Another leading IndyCar team, Dragon Racing, has joined the FIA Formula E World Cup, the new electric car racing series that's starting in September 2014. This makes the fourth team to publicly announce their participation in the Formula E.
The four teams announced so far are - Dragon Racing, Andretti Autosport, Drayson Racing and China Racing. The Formula E series is to have 10 teams each with two drivers. The FIA's World Motor Sport Council will consider for approval the final roster of 10 teams. 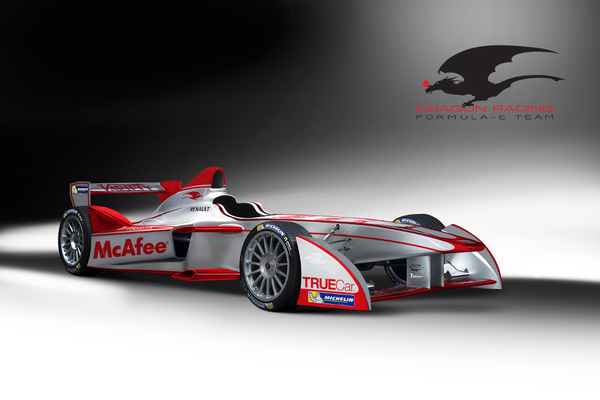 The Formula E series features Formula One style racing cars that are electric. Races will be held in city centers of leading cities around the world like London, Los Angeles, Beijing, and racing around iconic landmarks. The electric race cars, designed by a consortium of companies including Renault and McLaren, will be hitting speeds up to 140 miles/hr. Each car has a 20-25 minute racing time. The plan is to have two cars per driver and for the driver to swap cars halfway through the race. Dragon Racing is owned by media and publishing entrepreneur Jay Penske. In May 2007, they debuted at the Indianapolis 500 finishing an impressive fifth with Ryan Briscoe. In 2009 they completed their first full season with IndyCar claiming Rookie of the Year with Raphael Matos. They currently race two cars in IndyCar with drivers Sebastian Saavedra and four-time Champ Car World Series champion Sébastien Bourdais. In August Racing champion Gil de Ferran was named Formula E Ambassador, and Fox Sports was named as the broadcast network partner. In July the series announced they'd completed the 2014-15 calendar with deals for 10 host cities, and made arrangements for a consortium of companies to build the race cars.